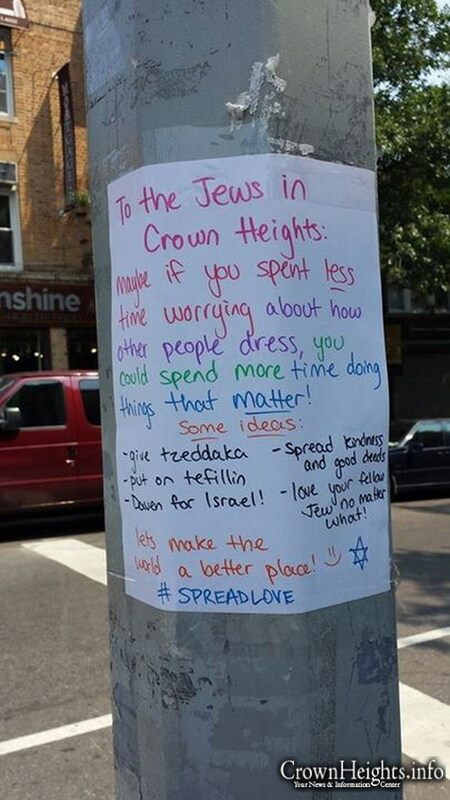 This is a guest post by Nechama L.
A few weeks ago, a series of signs were posted in Crown Heights, home to one of the largest chassidic (sect of Orthodox Judaism) communities in New York City, urging non-residents passing through to dress modestly. Supposedly, these signs were addressing people of all genders, but in practice, all subsequent comments on the signs singularly addressed women. In response, someone assumed by most to be a woman, though the poster could have been of any gender, posted a sign of her own. The sign became the picture of the day on CrownHeights.info, a news site for the Crown Heights Chassidic/Orthodox community. It was exciting that they posted it, and even more exciting to see it circling around my social media, with multiple “like”s and shares from women friends of mine within the Crown Heights Chabad community. Clearly the poster of this sign was not the only person within the community who felt that the posters of the original signs were over-stepping their bounds in pressuring women passing through the neighborhood to dress a certain way. Of course, there were also responses to this sign that were less “thrilling.” As usual, my favorite was the comments below the article. Needless to say, they are full of wisdom, logic, and deep insight into the workings of religion and humankind, so it would be a shame not to share some of them here. In Rashi-style commentary, I have appended my own commentary on how to translate these verses for their true meaning. Translation: I have never read Catch-22. Translation: No one is forcing you…but there are modesty squads patrolling the neighborhood who will politely threaten you if you don’t. Translation: Invented a new vaccine for HIV? Sorry, you’re still going to hell. I caught you wearing shorts. Translation: Your sexiness is magically murdering people across the globe. Translation: The current state of affairs, in which women in crown heights cover themselves literally from head to toe, is unacceptable. Translation: If women stopped wearing clothing according to rules from the middle ages that are not found anywhere in the actual bible, we would all become Wikkans. Immediately. Those love-spreading bastards! How dare people encourage others to treat each other with kindness, compassion, and respect. Luckily, most Orthodox Jews who I know agree that how women dress is the least of Orthodoxy’s concerns right now, will not literally cause the deaths of Israeli soldiers across the globe, and does not in any way cancel out other righteous acts that a person might do throughout their lifetime. The unfortunate thing is that there are many who don’t think this way, and sometimes their voices dominate — voices who see “love” as a word that means anything but. Yet if enough of us speak out, as did the brave person who posted their own sign, and the brave people who shared it, even if just on Facebook, maybe things can start to change. And maybe both Jews and non-Jews can see past the ugly parts of Judaism on the surface, past the streets covered by modesty signs, to the beautiful parts within.